Have you ever seen that light in a woman’s eyes? “Which light?” you may ask. “The look of love? Or the look of horror?” Results may vary depending on your Valentine’s Day gift, and there can be a fine line. 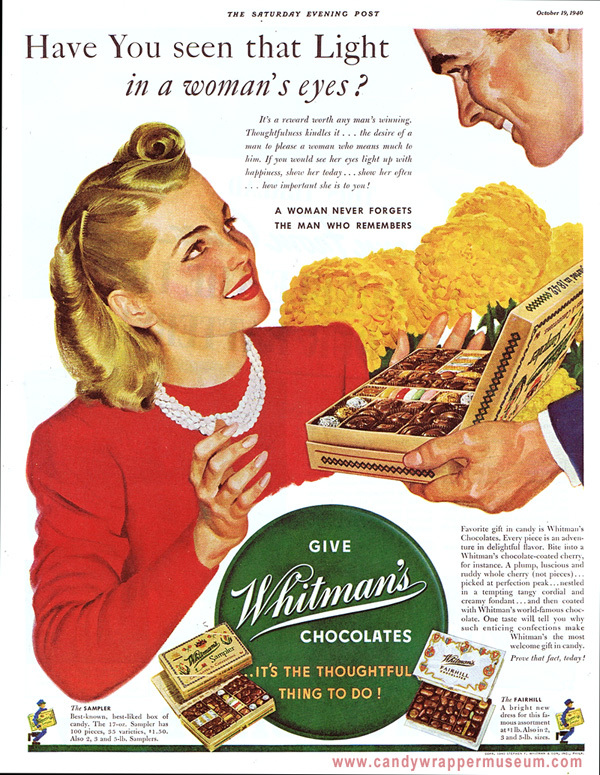 Study the ad below from 1940 to get a firm vision on what is supposed to happen. Somehow, I don’t think many of this year’s Valentine offerings are going to get the job done, but what do I know? This year, apparently the bar is very low. 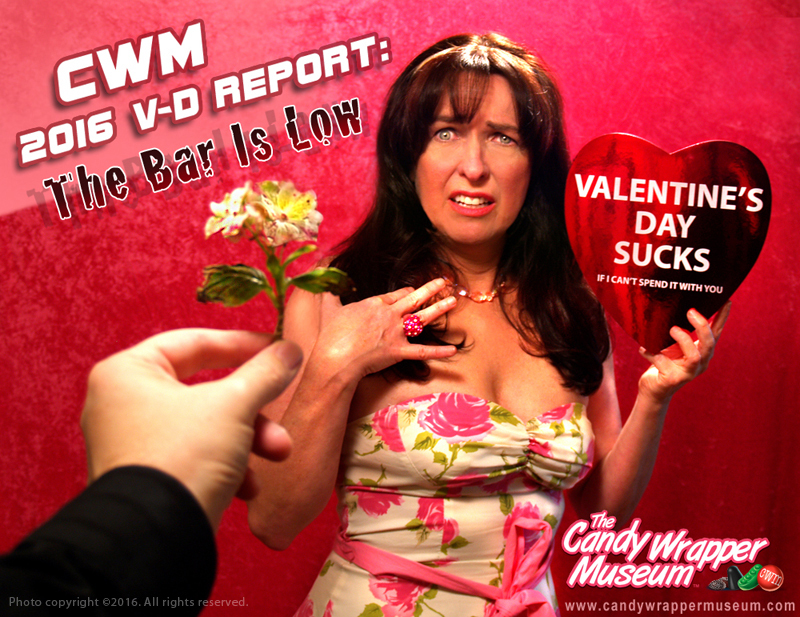 Each year, the Valentine’s candy gets worse, and I wonder, how low can it go? Valentine’s Day. People typically either love it, or they hate it. Personally, it is my favorite candy-giving holiday. Why? Because it is the day that captures the widest range of personal expression, sentiment, and style. Other holidays commemorate or celebrate saints, soldiers, noble people, days of victory, and days of fresh starts. Valentine’s Day? It celebrates you. And what’s inside. Considering this, anything goes on Valentine’s Day. But, you know what? It’s too much effort to type or even say “Valentine’s Day.” So, let’s just call it V-Day. 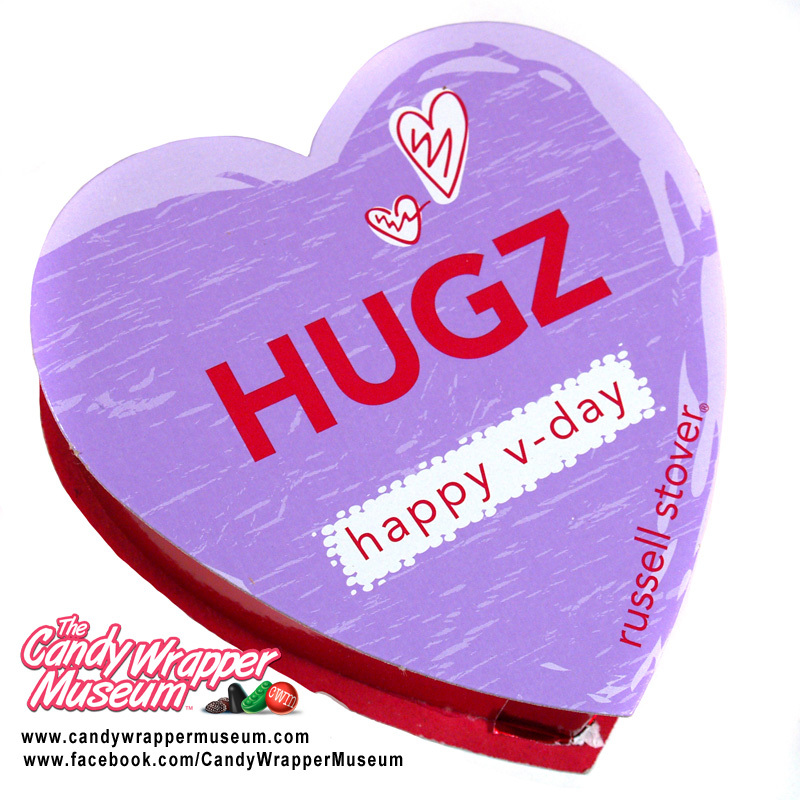 Yes, I know there is another day named V-Day, but it is so yesterday. Let’s just use it for 2-14. And I really want to convey my love for you, but sentences are hard to form. So, one word will do: HUGS. But that’s so many letters… so I’ll abbreviate it to HUGZ. Feeling special? You should be. V-Day wasn’t always this way. 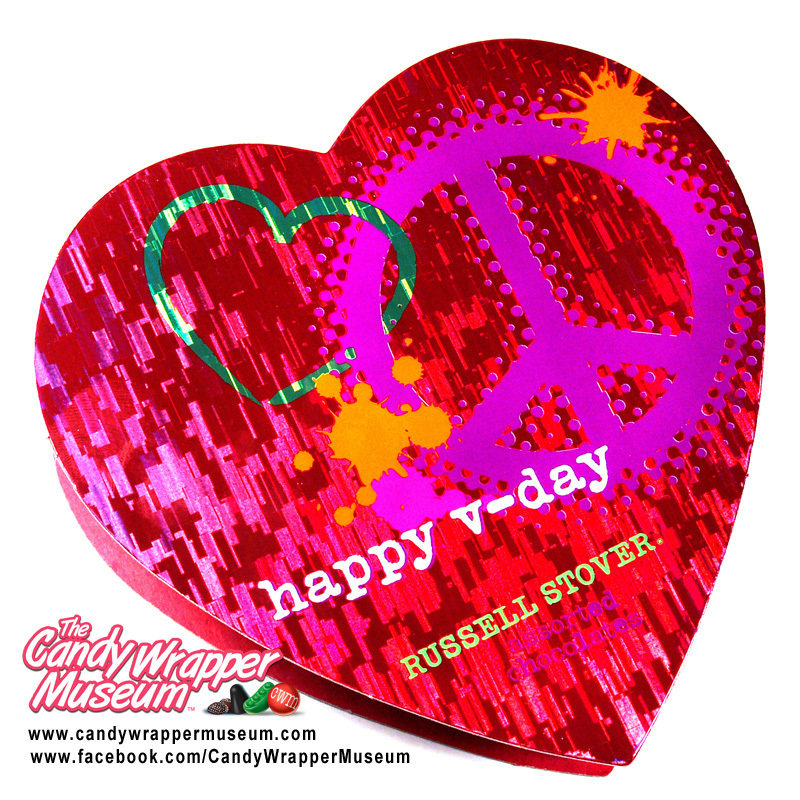 Let me share a few hearts of yesteryear that caught my eye as I was pawing through the Candy Wrapper Museum archives for this year’s post. 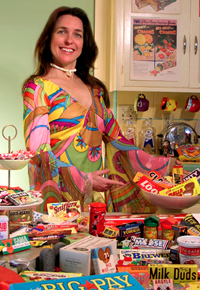 I couldn’t find a single celebrity endorsing V-Day candy this year. Overly familiar CGI characters that appear on every hunk of junk in the stores these days don’t count. So, I’ve brought out a fave from 2002. Elvis may have left the building, but he will never leave our hearts. When it comes to love, you know Elvis is always takin’ care of business. And how is it possible that little Hannah Montana already seems to be a character of long ago and far away? The candy inside was a plastic bag of low-grade chocolates made in China, but at least you got a nifty lenticular box with (SPOILER ALERT) Miley Stewart, the secret star, revealing her true identity as Hannah Montana. 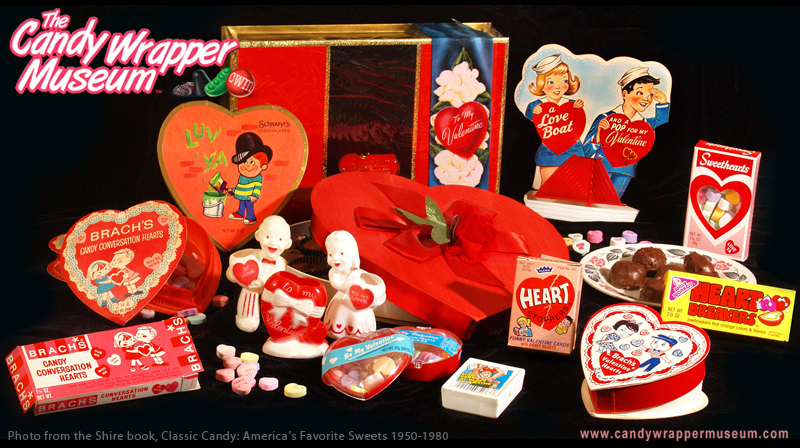 In closing, here is a look at a variety of classic V-Day candy from decades past. Zoom and scroll for a stroll through personal expressions of love from the past. It didn’t have to be expensive to be sweet and a treat to put that light in a woman’s or a girl’s eyes. Wishing you all a happy Valentine’s Day (there—I said it)! 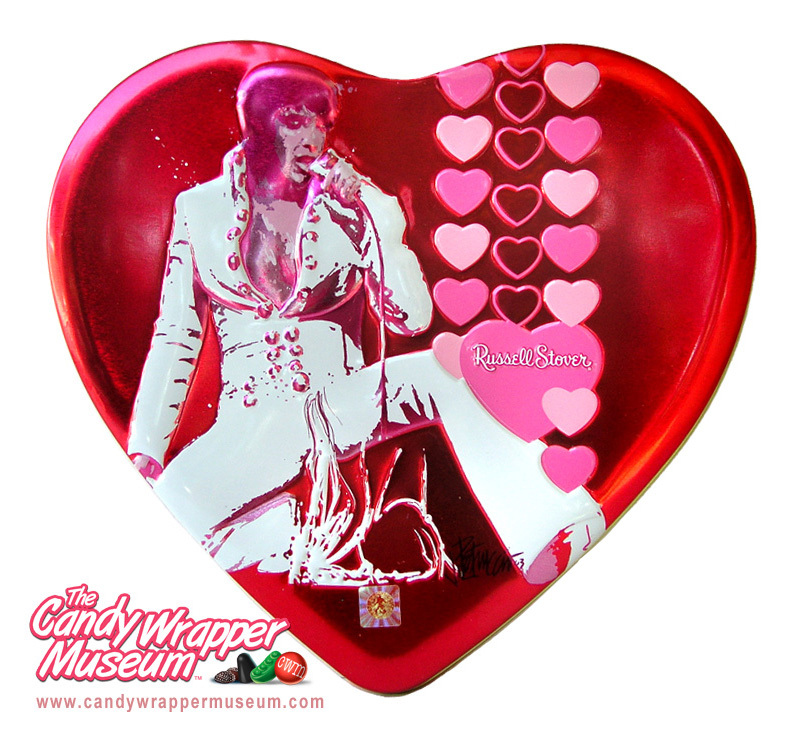 This entry was posted in Food and tagged Candy Wrapper Museum, Darlene Lacey, Elvis Presley, Hannah Montana, Sweet Talk, Valentine's Day, Vintage Candy. Bookmark the permalink.